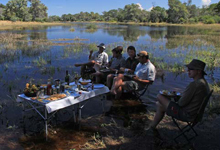 An exciting new safari product has been introduced to Botswana - the Selinda Canoe Trail ... this magical wilderness experience takes guests on a peaceful meander down the Selinda Spillway, a channel that connects the Okavango Delta with the Linyanti Swamps. After being without any water for 30 years, this channel started flowing again in 2008 in response to very high flooding of the Okavango Delta. The trail has a very low impact on the enviroment as the canoeists camp on the banks of the river, so no permanent camps or development of any kind has taken place in the introduction of this safari product.